« Is it possible to be a religious atheist? Can a Jewish ‘atheist’ have a Jewish wedding? Short answer : Yes. Shavuot: Let’s redeem this crotchity rabbinic holiday back to its roots as a harvest festival! Ahhh, it’s that time of year again; time for me to struggle with that oh-so rabbinic of holidays, Shavuot. I love the original Shavous — a holiday celebrating the first fruits and vegetables to appear in the season, and a reason to travel long distances to share one’s bounty with neighbors and priests. That’s what the holiday was all about in the Torah. 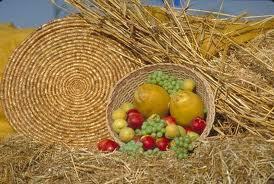 It was a spring harvest holiday, the yin-yang twin of the other harvest holiday that takes place in the fall: Sukkot. On this day, the Torah tells us, people would pack up the First Fruits of their harvest and make the long pedestrian trek to Jerusalem. Take a moment and picture what a rag-tag scene that must have been. Donkeys and babies. Food and water canteens made, I am imagining, from the bladders of animals. It’s not any different than the power-grab done by every other major world religion (and probably every minor religion too.) But as a post-Enlightenment human being blessed to live in a relatively free world, I’d love for my religion and my people to just speak honestly about why things are the way they are. I wish to keep my myths restricted to the reading of JRR Tolkien. And the holodec on Star Trek. It is up to us to hallow Creation, to respond to Life with the fullness of our lives. It is up to us to meet the World, to embrace the Whole even as we wrestle with its parts. It is up to us to repair the World and to bind our lives to Truth. Therefore we bend the knee and shake off the stiffness that keeps us from the subtle graces of Life and the supple gestures of Love. With reverence and thanksgiving we accept our destiny and set for ourselves the task of redemption.